Working on your, possibly first, assignment and unsure how to do your references? Not know the difference between references and citations, endnotes and footnotes, Harvard or Chicago, etc? We’ve got a few useful online resources that should help demystify the referencing process. Referencing the readings and material you have used for your research is vitally important. Not only does it demonstrate that you have actually spent time doing the research and using it to form your own opinions or arguments but it also means that you are not trying to make it seem that someone else’s work is your own. The action or practice of taking someone else’s work, idea, etc., and passing it off as one’s own; literary theft. A particular idea, piece of writing, design, etc., which has been plagiarized; an act or product of plagiary. At best bad referencing, however unintentional, can lead you to losing marks on your assignment, at worst you could be accused of plagiarism. One of the first things to check is what referencing style your subject uses. In the School of Social and Political Science (SSPS) the Harvard system is preferred by most subjects but do check as there are some exceptions. Your course handbook or Learn course should tell you this but if you are unsure speak to your Personal Tutor or Course Organiser. Useful resources to help you get it right. The Institute for Academic Development (IAD) at the University has some really useful guides and tips on Referencing and avoiding plagiarism. I’d recommend their Tips for accurate citing and referencing (pdf) as well as their short information sheets (pdfs) why is referencing essential?, including the work of others and what is plagiarism? If you are looking for more general advice, including some examples, then take a look at Edinburgh University Student’s Association’s Read. Write. Cite. For practical help take a look at Cite Them Right Online (UoE staff and students only). As well as having some really useful guidance on the Basics of referencing, you can use Cite Them Right Online to find out how you specifically reference material you have used in your research and it gives examples of both the in-text citation and reference list. The material is split into 8 resource types: Books, Journals, Digital & Internet, Media & Art, Research, Legal material, Gov & EU and Comms, use the headings to find the type of material you need to reference and how to do this. Why not use a reference management tool to help you save your references, organise your references and add your references into your written work? As a student at the University you have free access to EndNote Online (sometimes referred to as EndNote Web). To find out how you can use EndNote Online and all the ways it can help you with referencing (basically making it easier) watch the Using EndNote Online to Manage Your References video. Or download the workbook. EndNote desktop is available on all the open access PCs in the University and you can also buy the desktop version for your own computer at a discounted rate. There are other freely available reference mangement tools out there that you might want to try as well e.g. Zotero, Mendeley, etc. Have a look at your own School’s website or student intranet. Many will try and give you guidance on referencing and academic conduct. You can sometimes find good referencing advice, along with examples of how to reference, on other university websites e.g. University of Leeds, Monash University, etc. However, be aware that they may give guidance very specific to that university. For more help with topics such as time management, note making, reading, assignment writing and revision and exams give the IAD’s LearnBetter a try. This is an online course that you can do at any time. The above resources should hopefully give you some of the tools and know-how to help you become more confident in the art of referencing. 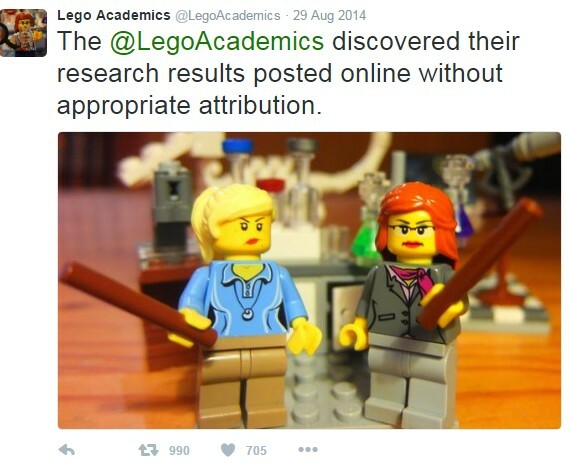 Lego Academics. (2014) [Twitter] 29 August. Available at https://twitter.com/LegoAcademics (Accessed: 14 October 2016). OED. (2016) “plagiarism, n.” [Online]. Oxford University Press. Available: http://www.oed.com/view/Entry/144939?redirectedFrom=plagiarism [Accessed: 14 October 2016]. This entry was posted in Library, Referencing and tagged citations, Endnote, good academic conduct, plagiarism, Social & Political Sciences, writing by spslibrarian. Bookmark the permalink.